Do you want to play a game? Seriously, let's. Last night the folks behind RoomEscapeArtist.com (REA) presented to the kind people at the Adventure Design Group (ADG) at The Laundry in SF. First off, holy crap, they’ve done a lot of room escapes. I’ve done…2 real ones and 4 of the SCRAP not-really-escaping-a-room escape rooms. They’ve done over 600? Assuming an average of $30/room, and ignoring the cost to travel and stay near the locations around the world, that’s still $18,000? Yikes. Since I was unfamiliar with their work, as I was waiting for the event to start, I looked their site up. You should do that, if you haven’t. They have a lot of good information if you are looking to go to an Escape Room. Someone was attempting to patent the idea of a mobile escape room. The folks at REA were not amused. Hopefully that has gone away. Not too long ago, Business Week spurred a lot of folks into creating Escape Rooms. Some of the less well-thought-out ones aren’t doing terribly well (as would be expected) and may be closing shop soon. That shouldn’t be interpreted as the bottom falling out. Or the sky falling. Someone’s bottom may be someone else’s sky? I don’t know. They were really impressed with a number of Rooms. Two that stood out for me were: Palace Games (I’ve done their Houdini and Roosevelt rooms) and primarily with Strange Bird Immersive in Houston (several friends went there and LOVED IT). After the presentation, I ended up chatting with an SF expat living in LA about Room Escape Games. Since I’m terrible at names, I think Lily? and I reminisced about the Jejune Institute. They’d done everything up through the Chapel of the Chimes, but moved before the Socio-Re-engineering event (Which honestly was probably for the best). I mentioned an old thought about Air-BnB-based Escape Room, and found out they’d done something similar. All in all, it was a good evening. My only regret was not having a moment to say hello to Laura Hall who was in town for the event. I’ve been playing games and doing puzzles my entire life, and I’m nearing 50. I’m more of a Jack-of-all-Games, Master of Few. But winning isn’t everything or the only thing. It’s a thing. I’m not here to win. I’m here to play. I believe that when everyone is enjoying a game, it’s one of the best things around. I have no patience for people who want to gate-keep or exclude people who are different. Speaking of which, my pronouns are he/him. 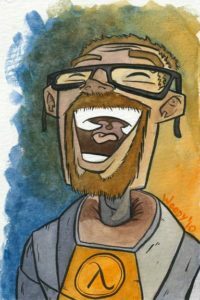 © 2017 Ariock® | Laughing Gordon Freeman by Kevin Woody. Used with Permission.